Preludio is really a warm-up exercise, quickly whipping up and down the keyboard to set the scene. The second study, without title, is a formidable capriccio with alternating hands and risky leaps which give a kind of reflection of Paganini’s virtuosity on the violin, though it must be added immediately that the notion that Liszt’s transcendental technique arose as a result of attempting to imitate Paganini’s effects is an oft-repeated canard. Paysage (Landscape) is a tranquil and intimate tone-painting, far removed from the little toccata that was its original form in 1826. (The 1826 versions contain little more than the melodic basis for the later sets, and in the case of Mazeppa, only the harmonic outline of the main theme.) Mazeppa, familiar from Byron and Hugo, was a Polish page, bound to a wild horse which released him only when, having galloped to the Ukraine, it died from exhaustion. The story adapts well to the piece, which is almost a set of variations, with an excellent thematic transformation of the opening theme into the gentler central section, and which eventually lead to the eponymous symphonic poem which Liszt published in 1856. Feux follets (Will-o’-the-wisps) is the most intricate of the studies, at one level a notorious double-note study, at another a mystical half-lit piece full of strange modulations. 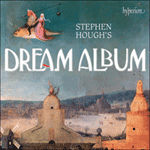 Vision is a broad, grand piece, very imposing in its use of arpeggio and tremolo, and Eroica is a triumphal march full of octaves. Wilde Jagd (Wild Hunt) is marked ‘Presto furioso’ and in the matter of leaps is the most reckless of the studies, beginning with jagged cross-rhythms which are later contrasted with a more four-square, fanfare-like theme. 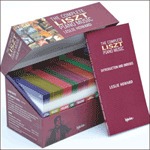 The last four studies are among Liszt’s finest works. Busoni’s epithet ‘like a packet of yellow love-letters’ is among few such bons mots about music that could ever be said to have hit the mark squarely, for Ricordanza is just that, with its old-fashioned operatic melody (marvellous tune for a boy to have written in 1826!) and its tender figurations. The great F minor study is well described by its direction ‘Allegro agitato molto’, and is the only example of a standard form in these studies—sonata form, with two subjects strongly contrasted in character and tonality, and rigorously developed. Harmonies du soir conjures up far more than peaceful scenery and distant bells, creating almost an orchestral dimension of sound as each theme is extended to cover the whole compass of the keyboard in the fullest Romantic grandeur. Chasse-neige (Whirlwinds of snow) achieves its grandeur by its very relentlessness, in which bleakness is conveyed by constant tremolo, and the blurred Impressionistic effect is heightened by the pedalling chromatic scales into the prevailing texture. That Liszt’s intentions were musically irreproachable is borne out by his clear rejection of any kind of applause-raising coda to the set: Chasse-neige ends imposingly but firmly without any change of mood. 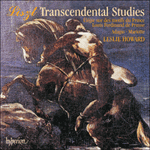 Two of Liszt’s Twelve Transcendental Studies. Whereas Chopin took exercises and made poetry out of their technical demands, Liszt created mini-operas.